Since the days when smog first made its presence felt and known, to a good many, air pollution awareness has done nothing but evolve; it’s been growing in the public’s consciousness, in other words. 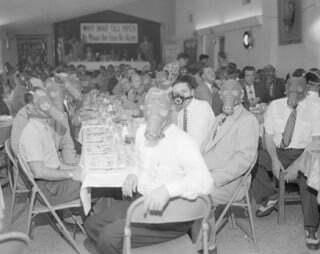 Moreover, in 1943, a year when major episodes of smog plagued the city of Los Angeles, there was no way for residents to avoid breathing the airborne miasmic crud in, that is, outside of donning gas masks or leaving town or lessening one’s exposure by staying inside. Smog could not help but become a top-of-mind concern among Angelenos at that time. That the smog had showed up seemingly out of nowhere (in the state’s southland air), this wasn’t really the case at all. It was a problem that was a long time in the making. And it was automobiles in the numbers of them being driven along with the numbers of miles being logged, compounded by the vast reduction in use of rail-based public transit that created the perfect storm for the area’s then smog formation. In that post and in referring to a second (such post) from an earlier time, and in providing commentary, I explained the reason behind the closures and reported on the effect on area air those two closures had. I submitted: “In my post: ‘An annual ‘National Healthy Air Awareness Day’? Nothing to lose save pollution,’ I made more than casual reference to Carmageddon and Carmageddon II, and July 15, 2011 and September 29, 2012, respectively, marked the first days of the corresponding weekends when a 10-mile Sepulveda Pass section of Interstate 405 in southern California was closed to traffic. For safety reasons, the closures were necessary because of demolition of a portion of the Mulholland Drive overpass situated overhead of the 405. In any event, when the required overhead bridge demolition work was completed, the 405 was again reopened to traffic. Air-wise, to those who took note, what actually occurred was quite, quite revealing for sure (to be taken in both the literal and figurative senses). Not surprisingly, subsequent to all the construction and improvement work being completed, traffic snarls in Sepulveda Pass became no less an issue and pollution as a result is right back up to pre-“Carmageddon” and pre-“Carmageddon II” levels. That we’ve researched our past is one thing. Where we are on the automated land-based transportation horizon in going forward, is quite another. Whether moving this way or that, the $64 million question becomes: Will the matter of air quality weigh even more heavily on people’s minds than what it does right now? Definitely something to think about as it isn’t just that transportation emissions are growing. It is that such emissions from said sector should be an ever more growing concern. California appellate court issues split decision on proposed L.A.-port-based rail yard – now what? !